In recent weeks, the adoption community has been tackling some tough questions – the validity of the adoptive family unit, the rights of birth (first) parents, the role of government in the way we Americans declare family and of course, the role of adopted people as the agents for change. You can spend hours on the internet reading articles about what happened to Baby Veronica, the supreme court case and ICWA (Indian Child Welfare Act). I stand firm only one thing. We, the observers, know only a small percentage of the story. I am left more with curious questions. I am curious about Veronica’s birthmother and how she came to her decisions. I am curious how Veronica’s (adoptive) parents will explain away her birthfather and all he did to parent her. I am even more curious how the initial promise of an open adoption will now be put into place and enacted. Who is really doing anything for Veronica? For many, if not most, of the adoptee community, the transfer was a sad day. For some of us, we wondered aloud…notwithstanding the time, the signature, the legal relinquishment, Veronica has a family who wants to parent her. Veronica was not taken from her family of origin due to abuse or neglect. She has birthfamily who wants to raise her as their own. Is the decree on a piece of paper versus the decree of a parent who is biologically related sacrosanct? I wonder how Veronica will make sense of her story when she googles her name later on in life. I don’t have an answer, but for any of us who have worked through a contested adoption, the lines become awfully blurry. When people say that every child belongs in a family, I can’t help but get an uneasy feeling that we are never talking about the same definition of family. Then there was the Reuters article on “re-homing” internationally adopted children to families found on the internet because their new first families were not able to parent them. I think you would have to be dead to not have a reaction of disgust that human beings can do this to other human beings. It feels like the idea of finding families for children has been relegated to the equivalent of a swap meet. The words “trafficking” and “commodification” are rampant when thinking about this article. As an adoptee who cringes whenever I read those words, never owning such labels as mine, I can’t deny those words ring slightly true here. And yet part of me is also thinking, how many domestically adopted children has this happened to, how many children who have been living with their biological families have been passed around to extended family members and been treated with such depravity? While we are casting stones, are we looking at those casting too? While we are waiting for others to change the system, is it enough for the adoptee community to just be angry and scream for change or scream for the banning of international adoption? I like to always cloak myself as just another adoptee, but truth be told, I have some crazy connections. There are adoptees in the field, in our community, who have been sounding the alarms for at least 10 years while simultaneously working with the very families who think about or do what the Reuters article mentioned. To name just a few of my friends – Melanie Chung-Sherman, Dr. Judy Eckerle, Susan Branco-Alvarado, Jackie Skalnik. I name them for anyone reading this post to get to know their names. Why? Because they are busy doing the work and are brilliant too in their construction of ideas and programs to help these vulnerable children. Our community has been so effective in supporting and propping up the angry voices we have neglected the voices of the helpers, those vested in one interest – the child who grows up to be one of us and needs a “family” of his or her own. So I shout out the names of my peers who are effecting change one family at a time in hopes that more people will call upon them and make them even busier. I ask BECAUSE…there is CHIFF (children in families first). While the timing was interesting, this was not in response to the Reuters article. Oh no, that would mean our government actually CAN move swiftly. Still, I believe, more outrage is due in response to this interesting solution to the worlds’ orphan problem. More outrage and more action! Spend any time with a group of adoptee therapists and workers in adoption and your eyes will roll with the mundane questions we keep asking – where is the money going to come from to staff this and effect the changes, who will be the accrediting body to oversea the ethical implementation of this new program, why are only groups and legislators who are doing the adopting the only ones supporting and why are the child protection/development organizations silent? We are a suspicious lot but annoyingly persistent in our pursuit for an ethical, transparent program to address the needs of vulnerable children. It is proposals like CHIFF that make me understand why we must declare our position on being pro or anti. Any nuance is lost on our legislative representatives. I have taken a long time to respond to all of the goings on in our adoption community lately. Frankly, I was just too overwhelmed. I am just one person, one adoptee, one social worker and like many of my other friends, carry the stories, heartaches and pain of dozens of other adoptees in the work we do as our “job.” But then I realized, I have 99 people who read my words on my blog. If I subtract about a dozen of my “followers” because you are my dear friends and love me and are already in the trenches with me, that still leaves a decent number of readers out there. If I could get just one of you to think about adoption differently and speak up, write a letter, make a phone call, I will never be only one. For the next time you read an article about adoption, think of me – a person who was adopted over the age of 5, who had her story changed in order to be adopted, who had multiple placements without a name or face to recall and who wants to find wholeness and fulfillment just like you, I hope your thoughts have been altered. How big is your brave?! While the government is shut down and many of our representatives are not able to respond to our emails and calls, I ask you to compose your letter or script to be sent in shutting down CHIFF. Why? Please read the most comprehensive analysis of CHIFF out there. With permission from the writers (who are adoptees), Kerry and Niels of Pound Pup Legacy, I have also added their post below. Check out the Stop CHIFF page on Facebook too. Late last week, Senator Mary Landrieu launched the latest initiative of the adoption lobby in congress, with the introduction of The Children In Families First Act of 2013. The bill is intended to counteract the decline in inter-country since 2004, a trend that has many prospective adopters worried and cuts heavily into the revenues of adoption service providers. The inter-country adoption lobby has been in full blown panic over this decline for several years now. Already in 2009, a legislative attempt was made to curb the downward trend by means of the Families for Orphans Act. This effort failed miserably, but now the adoption lobby has regrouped with new blood and fresh money. Children in Families First (CHIFF) is a much more powerful lobby group than the Families for Orphans Coalition ever was. The backbone of both groups is the same, centered around adoption advocacy organization Kidsave International and the two trade associations of adoption service providers: Joint Council on International Children’s Services (JCICS) and National Council for Adoption (NCFA), augmented by the treacherously named adopters group Equality for Adopted Children (EACH). Gone are Buckner International, Institute for Orphan Advocacy – which was never really more than a (now defunct) website owned by America World Adoption Association -, North American Resource Center for Child Welfare (NARCCW), Weaving Families Adoption Ministry (dissolved in 2009, after having operated for little over two years) and Jane Aronson‘s celebrity adoption vehicle Worldwide Orphan Foundation. The current incarnation of the the inter-country adoption legislation lobby group has added several heavy-weights: American Academy of Adoption Attorneys, Both Ends Burning , Center for Adoption Policy (CAP), Christian Alliance for Orphans, Congressional Coalition on Adoption Institute (CCAI) and the Saddleback Church. The inclusion of the Congressional Coalition on Adoption Institute is especially important. CCAI, as a coalition of members of congress, has access to legislators, even K street can only dream of. This enmeshment of special interests and legislature is unprecedented. Never before have members of congress so publicly embraced the interests of an industry and its clients. With the backup of CCAI, the American Academy of Adoption Attorneys, and the money from adoption zealot Craig M. Juntunen, founder of Both Ends Burning, The Children In Families First Act of 2013, actually has a chance of being enacted. Before we dig into the details of this legislative effort to revitalize international placement of children, let’s first look at the underlying assumption, the decline of inter-country adoption. It is not without reason, Mark Twain spoke about “Lies, damned lies, and statistics”. Using statistics, and especially the graphical representation thereof, we can make things look very differently from what they really are. The common thesis that inter-country adoption has been in decline is a ruse. Inter-country adoption is returning to normal levels after extreme growth between 1992 and 2004. What we are facing is not a decline, but a market correction after an adoption bubble. the rise of corrupt adoption practices in Guatemala. Adoptions from these three countries almost entirely explain, both the enormous growth of inter-country adoption between 1990 and 2004, and its decline since 2004. In 1990, inter-country adoption from China was virtually non-existent, with only 29 Chinese children adopted in the United States. That number rose quickly in the early 1990s and reached its peak in 2005, with 7,903 Chinese children being adopted in the United States. Russian adoptions only started in 1992, and peaked in 2004, with 5,862 Russian children adopted in the US. Guatemalan adoptions were already somewhat developed in 1990. That year 257 children from Guatemala were placed with American adopters. In 1990, the total number of children adopted from China, Russia and Guatemala was 286. In 2004, the number of children adopted from those three countries had risen to 16,164. This is an increase of 15,878. The total increase of inter-country adoption in that time-frame is 15,898. So it is safe to say that the rise of inter-country adoption between 1990 and 2004 can entirely be contributed to these three countries. In 2012 the total number of children adopted from China, Russia and Guatemala was 3,452 (mostly from China). 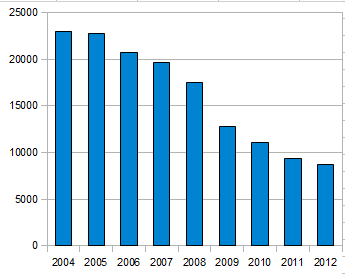 This is a decrease of 12,712 since 2004. The total decrease of inter-country adoption between 2004 and 2012 was 14,323. Again these numbers are in the same ball-park. Any other explanation than the burst of the bubble of adoptions from China, Russia and Guatemala, for the decrease of inter-country adoption since 2004 is bogus, or to speak with Mark Twain, a damned lie. Q. Isn’t this bill really just a way to increase the number of children available for international adoption? CHIFF is about one and only one thing: aligning United States foreign policy and programming with the undisputed, scientifically proven fact that children need loving, protective families to thrive. It therefore embraces every pathway to a permanent family and works to ensure that all options are being used to their fullest capacity in every country where there are children in need. To meet the needs of the MILLIONS of children outside of family care, governments all over the world will need to increase their efforts to preserve and reunify families; provide more direct support to kinship, and encourage domestic adoption as an important way to ensure families for children. At the same time, they will also need to put in place laws and systems that allow for international adoption as it is a necessary and appropriate way to meet the needs of children who cannot find homes domestically. The sad reality is that number of children internationally adopted by US Citizens is not declining because of a lack of need. It is declining because international adoption has wrongly been forced off the table of appropriate permanency options for children. CHIFF would change that. It must be said, this is a clever statement, in an Orwellian sense of the word “clever”. There is no downright denial of the fact that the bill is just an attempt to increase the number of inter-country adoptions, but it tries to frame the issue in a different light. Of course it can’t be done without adding further lies. Let’s start with the phrase: the undisputed, scientifically proven fact that children need loving, protective families to thrive. Science now proves conclusively that children suffer immediate, lasting, and in many cases irreversible damage from time spent living in institutions or outside of families, including reduced brain activity, reduced IQ, smaller brain size, and inability to form emotional bonds with others. While we won’t dispute that intensive contact with adult care givers is of the utmost importance to the brain development of infants, there is no scientific consensus that living in institutions or outside families is damaging to all children. In fact, an article published in Scientific American in 2009, under the title Orphanages Rival Foster Homes for Quality Child Care, refutes the stereotype that children fail to thrive in orphanages, and in fact receive care just as good as they would in foster care or through adoption. The research leading to this result had, unlike many other studies about developmental delays of orphans, not taken place in the dark and run-down children’s homes of post-communist Eastern Europe, but in countries like Cambodia, Ethiopia, India, Kenya and Tanzania, where care was given to children in more community-based orphanages. The adoption-centric agenda of the bill reveals itself in how children are confounded with infants. After all, most adopters have primarily interest in obtaining infants, and shy away from adopting children over the age of five. There is proof that infants that are not held and are not being socially engaged, indeed suffer all sorts of developmental problems, both emotional and cognitive. However, there is no proof that brain development of children above the age of five is seriously harmed by institutional care. Most of the children, the MILLIONS of children, mentioned in the FAQ answer, are not infants, and with that, of little interest to the adoption community. Their numbers are only included to inflate the statistics, and make the problem look worse than it really is. Every day, all over the world, more children find themselves living without families – on the streets, in orphanages, in refugee camps. By some estimates, there are now 200 million orphans in the world. Of course, like all the Pinocchio emulating efforts of the CHIFF group, it is not a complete lie. There is certainly some estimate that there are now 200 million orphans in the world. We could make up a figure out of whole cloth that there are now 3 billion orphans in the world and that too would be “some estimate”. The figure of 200 million, however, is based upon, and an inflation of a figure of 143 million orphans, mentioned in the report Children on the Brink, which UNICEF published in 2004. To reach this number, UNICEF used a very broad definition of the word orphan: a child who has lost one or both parents through death. While it is sad so many children lost one or both parents, it doesn’t warrant the claim these children actually go without parental care. Ironically, if children that have one living parent, get adopted abroad by a single parents, they suddenly don’t count as orphans anymore, while they move from one single parent household to another. The number of 143 million is already inappropriate to use in the context of this bill; inflating the number and speaking of “more children find themselves living without families” is most disingenuous. Not only are many of those 143 million children not living without families, their number is likely not to be growing. When UNICEF published their report, the Second Congo War had just formally ended with a estimated death toll between 2.5 million an 5,4 million. Despite ongoing turmoil and devastation around the world, there is no conflict of that scale at the moment. It is therefore more likely that we will see a decrease of the number of orphans than that we will see an increase. The sad reality is that number of children internationally adopted by US Citizens is not declining because of a lack of need. It is declining because international adoption has wrongly been forced off the table of appropriate permanency options for children. Since the reason behind the decline in inter-country adoption has already been discussed earlier, we have to question the motive for CHIFF’s claim that international adoption has wrongly been forced off the table of appropriate permanency options for children. The background for the statement can be found in the closure of Guatemala for inter-country adoptions, back in 2008. For many years, the adoption programs from Guatemala were known to be deeply corrupt. Already in 2001, Canada ended the adoption of Guatemalan children for that reason. The Netherlands followed a year later, and France ended adoption from Guatemala in 2004. While all receiving countries in the world were ending adoptions from Guatemala, or reducing the numbers to single digits, the export of children to the United States grew almost three-fold. The ease of adoption from Guatemala was seen as a sign of a deep problem in the rest of the world, but it was seen as a boon in the United States. Prospective adopters loved the programs, despite the steep price, and adoption agencies loved the programs, because of the steep price. In the end, Guatemala ended inter-country adoption in 2008, under pressure of UNICEF. Prospective adopters were furious about this decision, and so was the Joint Council on International Children’s Services (JCICS), a trade association of adoption service providers. UNICEF was blamed for putting the rights of children above the desires of adopters. Of course it wasn’t phrased in such politically incorrect terms, but it actually boiled down to that. UNICEF, as an international organization, uses an international philosophy of child protection. The United States, always in search for exceptionalism – it is the only country in the world that doesn’t use the metric system – has its own philosophy of child protection, rooted in the notion of permanency. Angered by UNICEF’s role in the closure of the adoption programs from Guatemala, and frustrated by the fact that the rest of the world doesn’t accept the American approach to child protection, CHIFF aims to realign the foreign policies of the United States, independent of UNICEF. The U.S. Government has effectively relinquished its policy role on international child welfare to UNICEF. We need to retake control of U.S. foreign policy on this critical issue and lead the way in shifting the world’s focus on to the importance of family for all children. According to CHIFF, it is time to take unilateral action in foreign policy. We all know how that worked out last time such an approach was attempted. The phrase “full legal recognition of the child’s status as child of the parents and of the parents’ rights and responsibilities regarding the child”,rules out any form of foster care, guardianship, or institutional care. It is all the more hypocritical of CHIFF to demand other countries in this world to end these child placement options, while the United States itself has one of the largest foster care systems in the world and has thousands of children placed in residential treatment centers. It all makes sense when we read this bill for what it is, a duplicitous attempt to increase inter-country adoption, to the benefit of prospective adopters and adoption service providers. In that context, the notion of permanency makes perfect sense, because it blocks all other child placement solutions other than adoption. Q. International adoption has so many problems and so much fraud. Don’t we have to fix that before we increase the numbers? It’s really important, when thinking about international adoption, or any humanitarian program, not to lose perspective and get misled because a few tragic cases go badly. We all grieve those cases. But we don’t shut down hospitals because a hospital’s error causes harm to a patient. We don’t shut down the banking system because a bank gets robbed. Instead, we work to ensure that there are laws in place that protect against errors and crime and prosecute wrongdoers. In this vein, CHIFF includes important elements that will help us be sure that we get it right for birth parents, adoptive parents and most importantly children in the international adoption system. Most notably, CHIFF better enables both the State Department and USAID to do the necessary work to identify unparented children, determine what is in their best interest and help them to get it, whether it’s family reunification, kinship, domestic or international adoption. It is also important to understand that there are children in the world for whom international adoption is not only the best option, but the only option for a permanent family. In almost every country in the world, older children, children in larger sibling groups and with special medical needs, domestic options are very limited. When international adoption is eliminated as an option, these children spend a lifetime in an institution, or worse, are left to fend for themselves. Interestingly enough the question itself – which, as is usual in FAQ’s, is phrased by CHIFF itself, not by some outside questioner – hints to the fact that the bill is indeed about increasing the number of inter-country adoptions, and not some other lofty goal CHIFF insists on working towards. The answer to this question comes right out of the play book of adoption propagandists. Every systemic problem in Adoptionland is always aregrettable incident and always limited to a few tragic cases. The realities of Adoptionland are that every country that exports more than a few hundred children each year for adoption, is faced with serious corruption. Do we really have to list the multiple trafficking cases in Bulgaria, Cambodia, China, El Salvador, Ethiopia, Guatemala, India,Liberia, Mexico, Nepal, Romania, Russia, Samoa, South Korea, Ukraine, and Vietnam, to make it clear that child trafficking for the purpose of adoption is a systemic problem, or should we treat the long list of Child trafficking cases all as isolated incidents? The comparisons in the FAQ answer to the medical field and the banking system are either erroneous, or make absolutely no sense. Hospitals are shut down when errors are systemic. Martin Luther King Jr.-Harbor Hospital is set to close down soon after failing a federal inspection. The action comes after a new round of questions about care, including one in which a woman writhed on the floor of the emergency room lobby for 45 minutes before dying of a perforated bowel. No one stepped in to help her. The Willowbrook hospital, once known as King/Drew, has been plagued by allegations of poor treatment almost since its inception 35 years ago. Scroll down for the latest coverage plus The Times’ 2004 series on King/Drew. Renaissance Hospital in Terrell had its license terminated and its doors shuttered Tuesday following the results of an investigation of massive safety failures that led to at least two deaths. On March 23 a division of the U.S. Department of Health and Human Services conducted a surprise inspection of the hospital near Ashland. Its conclusion was there is, “Immediate jeopardy to the health and safety of patients.” There are no patients at St. Catherine, and after state action last week, it cannot take in new patients. The banking system, doesn’t get shut down because a bank gets robbed – a most absurd comparison, since banks are not guilty when being robbed. More prudently, a bank doesn’t even get shut down when it is entirely corrupt and should be closed, since most members of congress receive huge donations from those very banks. In that sense the banking system receives similar protection from congress as the adoption system. Both can continue their corrupt practices even when systemic abuse and corruption has been demonstrated, because it suits members of congress to maintain the status quo. Unlike the answer to the FAQ question claims, the bill contains nothing to prevent corruption. In fact, it makes it easier. By collecting data toindentify unparented children in foreign countries, the bill makes it easier for child traffickers to find victims for their crimes. It may also make it easier for pedophiles to book their next holiday destination. The most flagrant dishonesty is reserved for the final paragraph of the FAQ answer. It claims that the bill helps older children, sibling groups and children with special needs. These three categories of children are notoriously unwanted by adopters and no speeding up of the adoption process is going to change that. In fact, the only reason that children from these categories are adopted to some degree these days, is because it is very hard to adopt infants. Also, by redirecting funds form USAID to facilitate inter-country adoption, as the bill aims for, less money will go toward older children, sibling groups and children with special needs. Exactly the most vulnerable children in the world stand the most to lose when this monstrosity of a bill gets enacted. All options for providing appropriate, protective, and permanent family care to children living without families must be considered concurrently and permanent solutions must be put in place as quickly as possible. Solutions include family preservation and reunification, kinship care, guardianship, domestic and intercountry adoption, and other culturally-acceptable forms of care that will result in appropriate, protective, and permanent family care. Preference should be given to options that optimize child best interests, which generally means options which provide children with fully protected legal status and parents with full legal status as parents, including full parental rights and responsibilities. The principle of subsidiarity, which gives preference to in-country solutions, should be implemented within the context of a concurrent planning strategy, exploring in- and out-of-country options simultaneously. If an in-country placement serving the child’s best interest and providing appropriate, protective, and permanent care is not quickly available, and such an international home is available, the child should be placed in that international home without delay. Let’s forget the lofty words kinship care, guardianship, and other culturally-acceptable forms of care, we already established that appropriate, protective, and permanent family care, requires parental rights. With that, the only real options are family preservation/reunification and adoption. Concurrent planning is an approach that seeks to eliminate delays in attaining permanent families for children and youth in foster care. Effective implementation requires comprehensive and early assessment. It involves identifying and working toward a child’s primary permanency goal (such as reunification with the birth family) while simultaneously identifying and working on a secondary goal (such as guardianship with a relative). This practice can shorten the time to achieve permanency if efforts toward the primary goal prove unsuccessful because progress has already been made toward the secondary goal. On the surface, it sounds reasonable to explore all options simultaneously, but it can easily lead to fast-tracked adoptions with only pro-forma investigations into family preservation/reunification. Concurrent planning only works if the agencies involved have no bias towards the chosen option. This is not the case in many foreign countries, where adoption agencies run orphanages, or donate large amounts of money to orphanages. Family preservation/reunification costs money, while inter-country adoption makes money and keeps customers happy. In such situations, concurrent planning is only a ploy to fast-track inter-country adoption. For all the reasons outlined in this article, Pound Pup Legacy started an action to stop this bill. On our website we will add further analysis of this bill, and report on any developments in congress to advance its enactment. We also created a Facebook pagehttps://www.facebook.com/StopCHIFF to raise more awareness about the terrible Children In Families First Act of 2013. A fantastic piece! PLEASE SHARE on your blog! Thank you – thank you – thank you – reblogged this. Fantastic analysis!